It was once on the so-called “Black List” survey of unproduced scripts well-regarded by industry insiders. Well, so much for that. It is about to have a miniscule opening, one month after it released on VOD. These was the same circumstances faced by Kevin Spacey’s most recent film, Billionaire Boys Club, which the trades trumpeted far and wide as the death knell of the disgraced actor’s career. So, are they going to say the same thing about Black List scripts, because fair is fair isn’t it? Actually, there is nothing fair about stupid stories that cherry-pick low opening grosses for films that are primarily seeking VOD business. 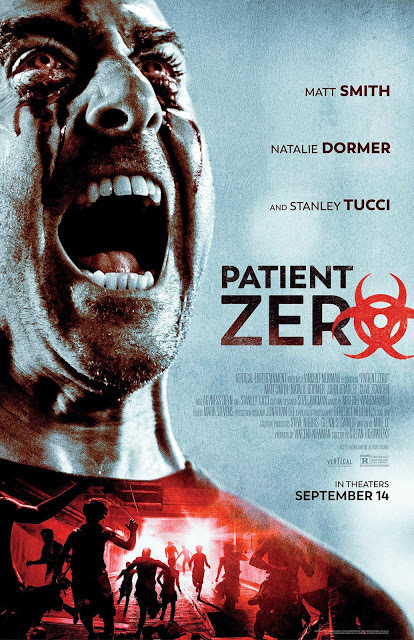 It would be particularly easy to beat up on this unfortunate genre picture, because it was dropped by a major distributor, but there are worse films hitting theaters this week than Stefan Ruzowitzky’s Patient Zero (trailer here), which opens in a few theaters somewhere this Friday. Rose is okay. In fact, Morgan is definitely attracted to her, creating a lot of awkward guilt for the “Infected Talker,” since his wife Janet is one of the Infected they are transfusing, in the hope they can eventually be cured. Of course, they have heightened hearing, so she knows. In contrast, it is the jerkweed martinet in charge of bunker security who really chafes Morgan, but his nemesis will be “The Professor,” a leader the Infected, who does not seem to follow any of the rules Morgan and Rose thought they had figured out. In fact, those rules are somewhat interesting and probably give is a sense of what the original Black List script read like. The Infected can’t process music, so Morgan, a former record store owner, uses classic rock and soul as part of the interrogation process. They also lost their ability to deceive—or did they? Unfortunately, just when the rules are fully established, they are thrown out and the film loses its distinctive vibe, becoming predictable and cliched. As you might expect, it is a good deal of fun to watch Stanley Tucci act all sinister as “The Professor” (but Mary Ann remains unaccounted for). Matt Smith also fully commits as the brainy but prickly Morgan, using a lot of his old Doctor Who acting muscles. Natalie Dormer is fine as Dr. Rose, but it too bad Agyness Deyn doesn’t get more screen time as Janet, the Infected, because her portrayal is really quite complex and emotionally engaging. Yes, Patient Zero clearly owes debts to Day of the Dead, 28 Days and Weeks Later, as well as scores of other zombie and pandemic movies, but Ruzowitzky keeps it moving along nicely. His output has been a little uneven since The Counterfeiters won the Academy Award, but his films usually have intriguing elements, especially the intense psycho-thriller, Cold Hell. Sure, it craters during the third act, but isn’t that always the way? In any event, it is far better than any reports of its minimal opening might suggest. 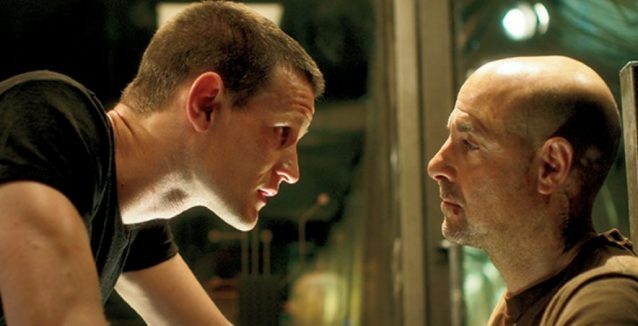 Recommended as a VOD distraction for fans of apocalyptic horror, Patient Zero opens somewhere this Friday (9/14).